Visiting the Colosseum is a breathtaking experience. 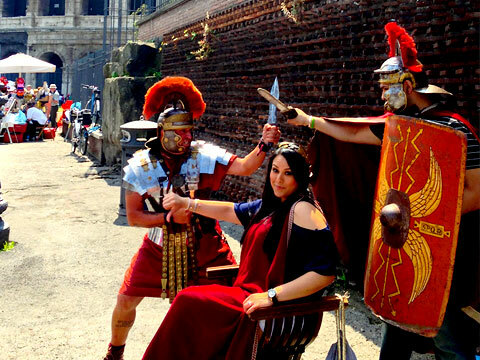 Discover the 2000 year history in a fun and entertaining way with your local expert guide. Visit the Colosseum, one of the largest structures of the ancient world, where Romans once gathered to watch the gladiator games, battles with wild beasts, and according to legend, sea battles. Discover how the Colosseum, a massive stone amphitheater which seated an estimated 60,000 spectators, was built in only 8 years. Your guide will unlock fascinating stories of the design and construction, the political benefit, the fighters, and the eventual end of the games at the Colosseum. 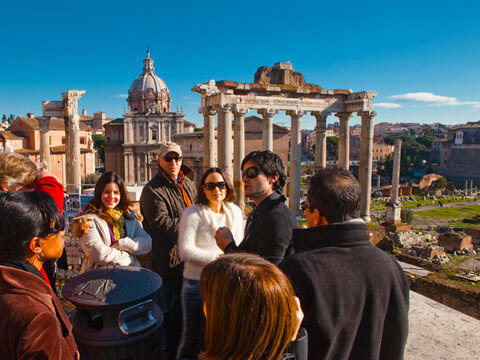 At the Imperial Roman Forum, your guide will bring to life the mythology, the popular celebrations of the time, and the gods of ancient Rome, which are reflected in the star signs in contemporary astrology. Learn how the pagan holiday Saturnalia influenced the unfolding of Christmas on the 25th of December today. Listen to the story of the Lapis Niger (Latin for ‘black stone’), the most ancient Latin text ever discovered in the world - which is housed in the foundation of a column in the Forum. Discover the Temple of the Vestal Virgins - six young women taken from aristocratic families to serve as virgin priests of Vesta. They worked in the temple for a period of 30 years under different emperors and were regarded almost as goddesses in status. Their foremost duty was maintaining the sacred fire of Vesta which represented the heart of Rome. As legend has it - as long as the sacred flame burned, Rome would endure and be victorious. 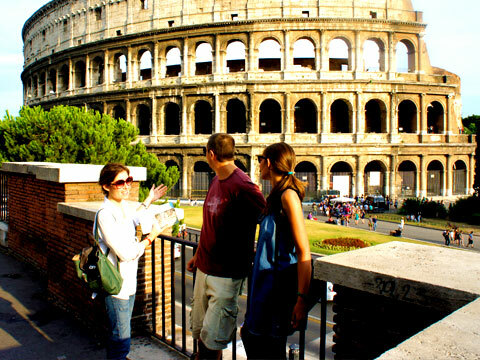 We include both Colosseum tickets and Roman Forum tickets, all skip the line of course! 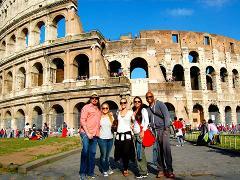 This Colosseum Private Tour is a must for anyone interested in learning about Ancient Rome in a fun way. 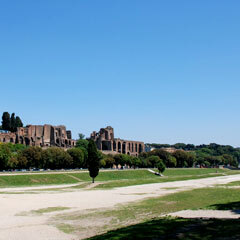 Walk where the Roman senate walked, see where the gladiators fought, and stand where the citizens welcomed the Roman soldiers after successful military campaigns. 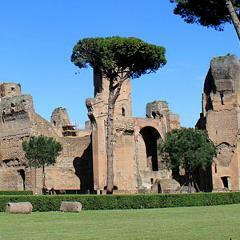 From the Forum you will take a pleasant stroll to Palatine Hill, where Rome is thought to have originated. Walk among its beautiful hills and gardens and explore the Domus Augustus - Villa of Augustus - the partially excavated palace of Augustus and successive emperors. 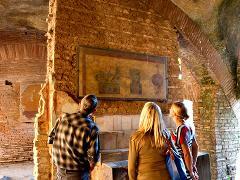 Your guide will discuss the legendary cave of Palatine Hill where, as myth has it, Romulus and Remus were found by the she-wolf who nurtured them through infancy. 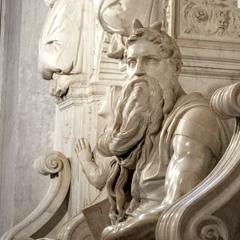 Do not miss one of the most famous statues ever carved by Michelangelo - The Moses. This masterpiece is located in the church of St. Peter's in chains just a few steps away from the Colosseum. An extra fee will apply if transportation is requested. US$70** Please note: That admission tickets are not included and will be purchased on site. 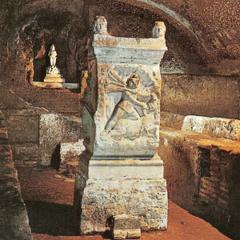 Visit one of the most famous churches in Rome, St. Clemente with its mysterious undergrounds. An extra fee will apply if transportation is requested. Don't miss Bernini’s Triton Fountain in Piazza Barberini or Rome’s twin church domes in Piazza del Popolo. You can opt to go up the Pincio hill for one of the best views in the city. 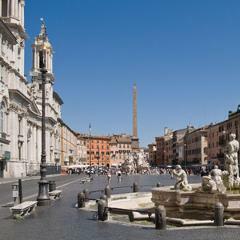 Or maybe you want to see the famed Piazza Navona? You will get plenty of ideas of where to eat and shop as you walk through these famous neighborhoods with your expert guide. An extra fee will apply if transportation is requested. One of the few places you can see ancient structure’s full height – you’ll be transported to the 3rd century as you walk among this vast bath complex. 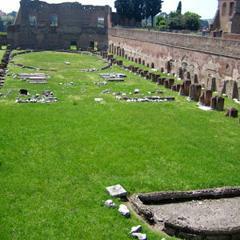 You'll see where slaves loaded ancient furnaces to heat the water for the different pools of this amazingly intact spa. You'll see mosaics that still decorate the pool floors, and even a game board used by bath visitors to pass the time while they soaked in the warm water. An extra fee will apply if transportation is requested. US$40** Please note: Entrance to the site is optional - Admission tickets will be charged separately. 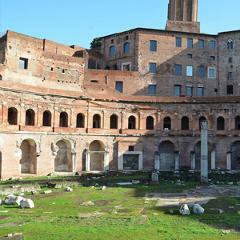 See the world’s first shopping mall in Trajan’s 2nd century “new” Roman Forum. See how history was recorded on the triumphal column, which documents the most important battles as well as marks the original height of the hill that was cleared to make way for the new construction. 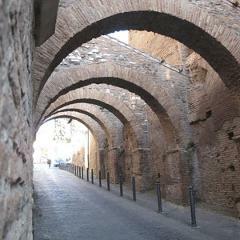 This marvel of Roman engineering will surprise and delight. We toured on the same day that we arrived, and it was great having the tour guide meet us at our hotel- it really took the stress out of getting around Rome, especially since we were more than a little tired when we arrived. We had time to relax, and we were so excited and refreshed when our tour started. I really appreciate how honest Eyes of Rome was about this cause when I was originally planning for my abuelita to come visit me from Mexico I was hoping we could visit the Colosseum together since it has been on her bucket list for many years but she unfortunately isn't in the best condition physically to be walking up those steep steps. Many other agencies I felt like could've easily swindled me cause they said no worries there's an elevator for your grandmother to take but when I booked with Eyes of Rome they were honest with me and told me that its not worth relying on the uncertainty of the elevators. 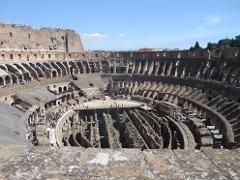 When we did the ancient Rome and Colosseum tour we were able to hear all the fascinating stories and appreciate it from the outside and this experience managed to bring tears to my grandma's eyes, a very special moment for us even without going inside. We're so pleased to hear that you appreciated our honesty and sincerity when organizing the tour for your grandmother. From the pictures you sent us via email, it seemed as if your whole family really enjoyed the Ancient Rome and Colosseum experience! Your guide informed us that you also live in Rome so if you have any further suggestions about ways we can make our tours more accessible, please keep in touch! We really enjoyed our tour guide Karin. She gave excellent background information about the Colosseum in all its past glory with perfect english and great attention to details. She really made me feel as if I could see it! 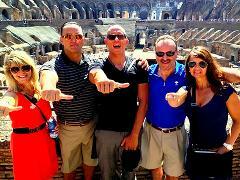 I am very grateful to have had the opportunity to meet her and have her guide me and my friends around the Colosseum. Grazie Karin! I look forward for your visit to San Diego. Unforgettable Colosseum!! 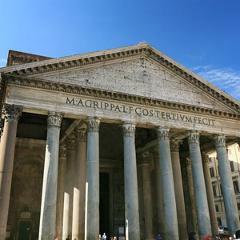 My husband and I visited Rome this summer and we had had a fantastic experience with Eyes of Rome. We got picked up at our hotel in a private car with a nice and careful driver who drove us to the Colosseum. Elisa, our guide, was waiting for us and soon begun our memorable visit through one of the most iconic symbols of the eternal city. Elisa was outstanding, making the tour interesting and engaging. Her attention to details and her passion in history and art helped us to see the Colosseum and Roman Forum through other eyes. As the Colosseum and Roman Forum are open-air archeological sites, morning visits are recommended. We truly enjoyed the tour with Eyes of Rome, and if you are likely to have Elisa as a story teller she will help to make it unforgettable. Please pass this message along to Elisa! I am looking forward to seeing you in Rome again! Colosseum and Roman Forum, never too old! My long time friend and I decided to visit the eternal city this summer. My words cannot explain how beautiful this city is and how amazed we were each day we spent there. One of the pick moment of our holiday was certainly the Colosseum and Roman Forum, a once-in-a-lifetime experience and Stefania our guide, made it all fantastic! She has been absolutely awesome, very knowledgeable and friendly. She was patience and arranged a perfect day through ancient Rome for two old ladies like us! Even though my friend and I walked slowly and especially the Roman Forum can be a bit tricky, Stefania chose the best route for us and explained everything even from far. Colosseum lift worked, but we were informed to don’t rely on it before going on tour. Stefania's friendly company has been very appreciated. Stefania you will be always welcome in Lafayette. Hi, if I add the Golf Cart extension to my Private Colosseum and Roman Forum Tour will we have like a 6h-tour or we can split the two tours? I would prefer to have lunch in-between....shall I book the tours separately? Grazie Karoline, here at Eyes of Rome we are well trained and, being expert storytellers, we know how to entertain our guests :) Please feel free to contact either me or our Tour Design Team next time you'll come to Rome! I want to show you many other sites! See you soon e...un bacio! Ciao and grazie for your question! Many thanks for your question! It is actually not possible to modify the starting time of the tour at the moment of your booking. Please feel free to book the regular tour with one of the two suggested starting times, then contact us at info@eyesofrome.com! We will be happy to discuss with you the options available (depending on the tickets availability on the requested tour date)! Tour Start Time: You can select your favorite starting time. We recommend 09:30AM or 1.30PM in the months between November/March, or 08:30AM or 3:00PM in the months between April/October. Photos: Photos and Video are allowed. Children Tour for Free: Children aged 17 and under tour free with paying parents. However tickets are required for children aged between 2 and 17. Kids between 0 and 2 do not require a ticket. Personal Items: Large bags are NOT allowed in the Colosseum. 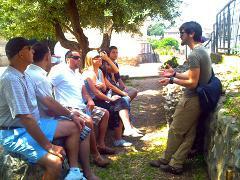 Tips: Be prepared to climb uneven steps and explore an archeological site - wear good shoes. Anticipate Rome's intense heat in the summer - you may want to bring a small umbrella to block the sun as well as bottles of water.